An art song is a vocal music composition, usually written for one voice with piano accompaniment, and usually in the classical art music tradition. By extension, the term "art song" is used to refer to the collective genre of such songs. An art song is most often a musical setting of an independent poem or text, "intended for the concert repertory" "as part of a recital or other relatively formal social occasion". While many pieces of vocal music are easily recognized as art songs, others are more difficult to categorize. For example, a wordless vocalise written by a classical composer is sometimes considered an art song and sometimes not. 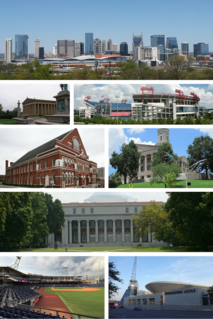 Dawn Upshaw was born in Nashville, Tennessee. She began singing while attending Rich East High School in Park Forest, Illinois and was the only female ever promoted to the top choir (the Singing Rockets) as a sophomore, according to choir director Douglas Ulreich. She received a B.A. in 1982 from Illinois Wesleyan University, where she studied voice with Dr. David Nott. She went on to study voice with Ellen Faull at the Manhattan School of Music in New York City, earning her M.M. in 1984. She also attended courses given by Jan DeGaetani at the Aspen (Colorado) Music School. She was a winner of the Young Concert Artists International Auditions (1984) and the Walter M. Naumburg Competition (1985), and was a member of the Metropolitan Opera Young Artists Development Program. Since her start in 1984, Upshaw has made more than 300 appearances at the Metropolitan Opera. Rich East High School or REHS is a public four-year high school located in Park Forest, Illinois, a southern suburb of Chicago in the United States. Rich East's campus serves the cities of Park Forest, Matteson, Olympia Fields, Chicago Heights and Richton Park serving sections of school districts 162 and 163. Oscar W. Huth Middle School, Illinois Elementary School, Barack Obama School of Leadership and STEM and Michelle Obama School of Technology and the Arts serves as feeder schools. It is a part of Rich Township District 227, which also includes Rich South High School and Rich Central High School. Park Forest is a village located south of Chicago in Cook and Will counties, Illinois, United States. As of the 2010 census, the village had a population of 21,975. Park Forest is bordered by Olympia Fields to the north, Chicago Heights to the east, University Park to the south, and Richton Park and Matteson to the west. Upshaw came to international fame with her performance on the million-selling recording (1992), with David Zinman, of the Symphony No 3 by Henryk Górecki, known as the Symphony of Sorrowful Songs (Symfonia pieśni żałosnych). David Zinman is an American conductor and violinist. The Symphony No. 3, Op. 36, also known as the Symphony of Sorrowful Songs, is a symphony in three movements composed by Henryk Górecki in Katowice, Poland, between October and December 1976. The work is indicative of the transition between Górecki's dissonant earlier manner and his more tonal later style and "represented a stylistic breakthrough: austerely plaintive, emotionally direct and steeped in medieval modes." It was premièred on 4 April 1977, at the Royan International Festival, with Stefania Woytowicz as soprano and Ernest Bour as conductor. Henryk Mikołaj Górecki was a Polish composer of contemporary classical music. According to critic Alex Ross, no recent classical composer has had as much commercial success as Górecki. Górecki became a leading figure of the Polish avant-garde during the post-Stalin cultural thaw. His Webernian-influenced serialist works of the 1950s and 1960s were characterized by adherence to dissonant modernism and drew influence from Luigi Nono, Karlheinz Stockhausen, Krzysztof Penderecki and Kazimierz Serocki. He continued in this direction throughout the 1960s, but by the mid-1970s had changed to a less complex sacred minimalist sound, exemplified by the transitional Symphony No. 2 and the hugely popular Symphony No. 3. This later style developed through several other distinct phases, from such works as his 1979 Beatus Vir, to the 1981 choral hymn Miserere, the 1993 Kleines Requiem für eine Polka and his requiem Good Night. She has premiered more than twenty-five new works, notably Henri Dutilleux's song-cycle Correspondances, and has embraced several pieces created for her, including the Grawemeyer Award-winning opera L’Amour de Loin by Kaija Saariaho, The Great Gatsby by John Harbison, the nativity oratorio El Niño by John Adams, and Osvaldo Golijov's highly acclaimed chamber opera Ainadamar and song cycle Ayre. In 2009 she premiered David Bruce's song cycle The North Wind was a Woman at the gala opening of the Chamber Music Society of the Lincoln Centre's season. Henri Dutilleux was a French composer active mainly in the second half of the 20th century. His work, which garnered international acclaim, followed in the tradition of Maurice Ravel, Claude Debussy, Albert Roussel and Olivier Messiaen, but in an idiosyncratic style. Correspondances is a song-cycle for soprano and orchestra written by the French composer Henri Dutilleux in 2002–2003. The Grawemeyer Awards are five awards given annually by the University of Louisville. The prizes are presented to individuals in the fields of education, ideas improving world order, music composition, religion, and psychology. The religion award is presented jointly by the University of Louisville and the Louisville Presbyterian Theological Seminary. Initially, the awards came with a bonus of US$150,000 each, making them among the most lucrative in their respective fields. This cash prize increased to $200,000 beginning in 2000. Beginning in 2011 the award amount dropped to $100,000 after the fund for the prize lost money due to a drop in the stock market. In addition to her operatic recordings, she has also sung the title role in the first complete recording of the score of Gershwin's Oh, Kay! . She has also recorded albums of songs by Vernon Duke and Rodgers and Hart. Upshaw was a guest of President of the United States Bill Clinton and Mrs. Clinton on the NBC special, Christmas in Washington. The BBC presented a prime-time telecast of her 1996 London Proms Concert, "Dawn at Dusk", in which she performed songs from the American musical theater. Her engagements with James Levine over the years led to a 1997 recording of Debussy songs. Vernon Duke was an American composer/songwriter, who also wrote under his original name, Vladimir Dukelsky. He is best known for "Taking a Chance on Love" with lyrics by Ted Fetter and John Latouche (1940), "I Can't Get Started" with lyrics by Ira Gershwin (1936), "April in Paris" with lyrics by E. Y. ("Yip") Harburg (1932), and "What Is There To Say" for the Ziegfeld Follies of 1934, also with Harburg. He wrote the words and music for "Autumn in New York" (1934) for the revue Thumbs Up! Vernon collaborated with lyricists such as Johnny Mercer, Ira Gershwin, Ogden Nash and Sammy Cahn. Rodgers and Hart were an American songwriting partnership between composer Richard Rodgers (1902–1979) and the lyricist Lorenz Hart (1895–1943). They worked together on 28 stage musicals and more than 500 songs from 1919 until Hart's death in 1943. She appears on an album of Christmas music in association with Chanticleer titled 'Christmas with Chanticleer featuring special guest Dawn Upshaw' for Teldec Classics. She tours regularly with pianist Gilbert Kalish. Richard Goode and Margo Garrett are also long-standing partners. She has worked with the director Peter Sellars many times, including his staging of Händel's Theodora at Glyndebourne, his Paris production of Stravinsky's The Rake's Progress (as part of the Los Angeles Philharmonic and Esa-Pekka Salonen's month-long residency at the Théâtre du Châtelet) (1996), a staging of Bach's cantata Mein Herze schwimmt im Blut, BWV 199, presented in the 1995-96 season at New York's 92nd Street Y, and the Salzburg Festival production of Olivier Messiaen's Saint François d'Assise (1998). Upshaw has often performed as a soloist at the annual Ojai Music Festival in Ojai, CA; most recently in 2006, 2008 and 2009. In 2011, she was the Music Director of the festival, where she performed the world premiere of the Peter Sellers' staged production of George Crumb's work, Winds of Destiny. She joined the Saint Paul Chamber Orchestra as Artistic Partner beginning with the 2007-08 season, and she is Artistic Director of the Graduate Program in Vocal Arts at the Bard College Conservatory of Music, which accepted its first students in the 2006-2007 academic year. She also is a faculty member at the Tanglewood Music Center. Gilbert Kalish is an American pianist. Richard Goode is an American classical pianist who is especially known for his interpretations of Mozart and Beethoven. Peter Sellars is an American theatre director, noted for his unique contemporary stagings of classical and contemporary operas and plays. Sellars is professor at UCLA, where he teaches Art as Social Action and Art as Moral Action. She holds honorary Doctor of Arts, honoris causa, from Yale University, the Manhattan School of Music, Illinois Wesleyan University and Allegheny College. Esa-Pekka Salonen is a Finnish orchestral conductor and composer. He is principal conductor and artistic advisor of the Philharmonia Orchestra in London, conductor laureate of the Los Angeles Philharmonic, and music director-designate of the San Francisco Symphony. Osvaldo Noé Golijov is an Argentine composer of classical music and music professor, known for his vocal and orchestral work. Kaija Anneli Saariaho is a Finnish composer based in Paris, France. John Harris Harbison is an American composer, known for his symphonies, operas, and large choral works. The Orpheus Chamber Orchestra is a classical music chamber orchestra based in New York City. They have won several Grammy Awards. It is known for its collaborative leadership style in which the musicians, not a conductor, interpret the score. Ainadamar is the first opera by Argentinian composer Osvaldo Golijov. The Spanish-language libretto is by American playwright David Henry Hwang. It premiered in Tanglewood on 10 August 2003 and, after major revisions, the new version given its premiere at the Santa Fe Opera on 30 July 2005. Amanda Forsythe is an American light lyric soprano who is particularly admired for her interpretations of baroque music and the works of Rossini. Forsythe has received continued critical acclaim from many publications including Opera News, The New York Times, The Wall Street Journal and the Boston Globe. L'Amour de loin is an opera in five acts with music by Kaija Saariaho and a French-language libretto by Amin Maalouf. The opera received its world premiere performance on 15 August 2000 at the Salzburg Festival. Gabriela Lena Frank is an American pianist and composer of contemporary classical music. Jessica Rivera is an American soprano of Peruvian-American ancestry. She is a 1996 graduate of Pepperdine University, and earned her Master of Music degree in 1998 from the University of Southern California's Flora L. Thornton School of Music. Rivera's early work included singing in the chorus of Los Angeles Opera. Lynn Chang is a Chinese American violinist known for his work as both a soloist and a chamber musician. Chang is a founding member of the Boston Chamber Music Society and is currently a faculty member at MIT, Boston University, the Boston Conservatory, and the New England Conservatory of Music. La Passion de Simone is an oratorio composed by Kaija Saariaho to a libretto in French by Amin Maalouf, first premiered in a staging by Peter Sellars. The work, subtitled "a musical journey in 15 stations", centers on the life and writings of Simone Weil and was conceived in the Passion Play tradition with episodes in her life linked to the Stations of the Cross. It is composed for SATB chorus, soprano soloist, spoken voice, orchestra and electronic instruments. Kelley O'Connor is an American singer. She earned her Bachelor of Music degree from Thornton School of Music at the University of Southern California and her master's degree in Music from the University of California, Los Angeles. Barbara Hannigan is a Canadian soprano and conductor, known for her performances of contemporary opera. The Avanti! Chamber Orchestra is a Finnish ensemble that focuses on contemporary music. The ensemble when it performs varies in size from a solo player to a symphony orchestra. Avanti! Chamber Orchestra won the Gramophone Prize with their first recording. The Orchestra also holds a music festival of its own each summer. Eric Lamb is an American flutist and Altus performing artist who performs and teaches across the United States and Europe. Gloria Cheng is an American pianist who won a Grammy Award for her 2008 Piano Music of Esa-Pekka Salonen, Steven Stucky, and Witold Lutosławski, and a nomination for The Edge of Light: Messiaen/Saariaho. Her film, "Montage: Great Film Composers and the Piano" (2016), documenting the recording of the eponymous CD of works composed for her by Bruce Broughton, Don Davis, Alexandre Desplat, Michael Giacchino, Randy Newman, and John Williams, aired on PBS SoCal and was awarded the 2018 Los Angeles Area Emmy for Independent Programming. She is on the faculty at UCLA. She served as 2012 Regents Lecturer at the University of California, Berkeley. ↑ "Upshaw". Archived from the original on 2012-02-12. Retrieved 2015-03-30. Los Angeles Times, January 15, 2005, in the article: "'Kafka' is told in the space between said and unsaid", by Mark Swed, Times Staff Writer/Music Critic. Dawn Upshaw (February 1, 2002). "A Cup of Tea with Dawn Upshaw". NewMusicBox (Interview). Interviewed by Frank J. Oteri (published January 3, 2002).